Northeast High School in Pasadena, Maryland needed to bring their facilities into the current technological age. The school hired consultant Steven Sinclair of Polysonics, an engineering firm in Virginia, to design their new AV systems. 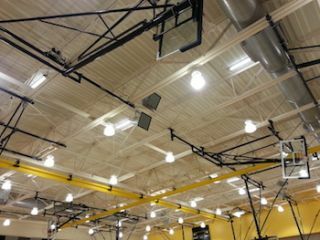 After winning a public bid, HP Electronics, a full-service AV integrator in Baltimore, installed the school’s new AV systems. The new AV system in the gymnasium is in constant use by students at Northeast High School. Northeast High School is a four-year public high school with almost 1600 students and several notable sports teams, a growing music program, and its own designated acting troupe that puts on three shows a year. Sinclair specified Community loudspeakers for all three Northeast venues. The gymnasiums feature Community R1-94 two-way loudspeakers supplemented by R2SUB subwoofers. The multi-purpose cafeteria has Community WET Series W2-228 loudspeakers in the high-ceiling areas and CLOUD1299 12-inch coaxial ceiling loudspeakers in the dropped-ceiling areas. The black box theater uses Community CPL42-94 two-way loudspeakers supplemented by CPL51 subwoofers. The subwoofers are permanently mounted in the room while the two-way CPL42-94s were provided as portable loudspeakers for the varying productions that take place in this theater.